**This article may include links to products we love. If you choose to purchase from our referral links, we earn a small commission. Thanks for your support. When my child was about two, she started becoming very picky. Before that we were under the full motto of “food is just for fun under one.” That spread to one and a half, and before I knew it two hit us like a barrel of bricks. We’d sit down to a meal at the table as a family, or me by myself with her as a stay at home mom, and the food would.not.budge. Sure, some of it was just her learning how to use her fine motor skills, but child why won’t you try a bite of strawberries, avocado, beans or chicken? You are driving me crazy with your picky eating. I found myself yelling, upset and beyond frustrated when I would spend time to cook a meal and it felt like she couldn’t be bothered to eat. In reality, she needed practice and that’s exactly what my system helped to give her. So I took my sanity back and invented the container system. I’m a mom who was simply at my whit’s end, and was done with scrapping food into the bin, meal after meal. What is the container system you might ask? If you have a fussy eater, it is one way to save your own sanity. Start with lots of tiny containers. I picked up a set of plastic containers from Ikea originally because I needed something inexpensive to bring snacks with us that were in appropriate child size portions. See all the tiny containers in this set? The tiny square and rectangle containers were the ones I used most frequently for snacks at the time. The snacks I felt like I needed to have on hand felt endless at the time, and having containers prepped and ready saved my sanity. I wanted to be out of the house every day, and having a few of these containers prepped meant I was ready to go in the morning quicker. You don’t have to have this set to use the container system, (in fact their are probably better options for on the go like one of my favorite bento boxes in snack size) but having containers helped me to be able to rotate through easier in my fridge, and helped my husband to participate actively too. Prep a variety of fruits, veggies, proteins and grains in the containers, two to three days worth and a mix of familiar foods and a new food. At mealtime, pick one ingredient you are cooking with and add it to a container. For example, proteins often require cooking, leave a bit of chicken or egg out before mixing together that pad thai so your kid can continue to be introduced to it over the next 2-3 days. At mealtime, offer food from two containers plus a small portion of whatever the family is eating. After meal or snack time, scoop leftover food (that’s not smashed or mixed like crazy) back into containers. Replenish containers as needed, but keep offering food from containers that have not been eaten. After 3 days discard any food that you originally prepped and has not been eaten. This allows you to put familiar foods next to new foods over and over again without busting your gut to cook something new every time. It encourages the child to still try what the family is having. It continually puts familiar foods on their plate, which can reduce anxiety over mealtimes. It gives you a quick option for on the go when you need to get out the door, but still need snacks on hand. The container system is not a quick fix for a picky eater. We used this process for months to encourage our child to try new foods, it will not instantly mean your child will eat. Some foods may take longer than others, and some foods your child may not like. Start small, and add new foods every week, and I bet you will see your child participate more and more in mealtimes as foods become more and more familiar. Have an older child and skeptical that this system is just for tiny kids? It can work similarly by having communal containers of fruit, veggies, protein, and grains prepped but in communal portions. When your older kid wants a snack they can “pick from two containers” or pick one of what they want and one other container.” It also means at dinner several of the containers find their way to the dinner table. Eventually, they may even help you with the process. 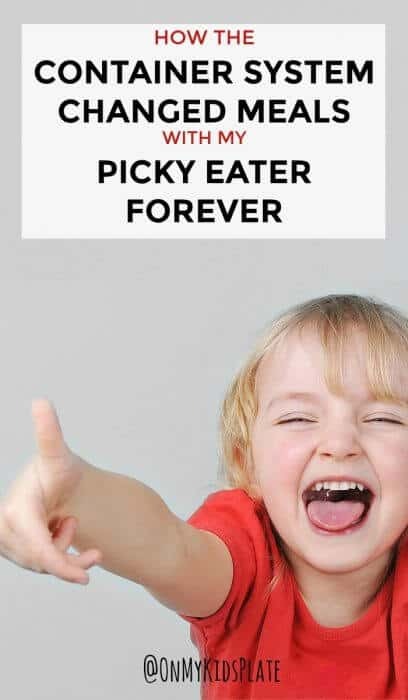 Frustrated about your picky eater? Join my Facebook group for picky eater recipes and support! So tell me, have you tried the container system with your kid? 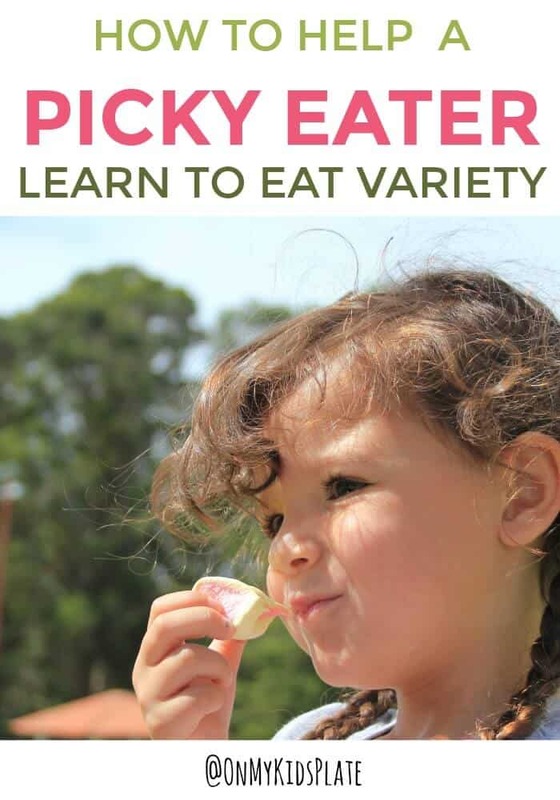 Have you used any other ideas to help your picky eater enjoy mealtimes more? I’d love to hear what works for you and your family down in the comments. That is so interesting. I hadn’t even heard of this before! Thanks for sharing. Well, here’s another system, assuming you’re not serving anything wildly exotic or spicy: “You don’t want what’s in front of you? Fine. Nothing else until the next scheduled family meal. Oh and you won’t be tempted to sneak anything out of the kitchen because you’re grounded in your room.” This nonsense about wheedling and tricking your children into eating perfectly acceptable meals has got to stop. They shouldn’t be allowed to treat your kitchen as though it’s a fast food drive through window. Who’s in charge here anyway? Well obviously this will make for a pleasant dining experience for both parents and kids. I’m so glad that being super firm always works for you, but that’s not my parenting style and it’s working pretty well for us. No one is treating the kitchen like a drive-through window, unlike some parenting strategies you aren’t preparing any extra food with this method then you would have offered anyways- just helping your kid learn. But if strong-arming works for you, by all means don’t let my suggestions stop you.